Van Gaal is still waiting for his first competitive victory as United manager. LOUIS VAN GAAL admitted Manchester United are playing well below the standards he demands after his spluttering side were held to a 0-0 draw by Burnley yesterday. Van Gaal heads into the international break still waiting for the first victory of his United reign after two draws and a defeat in the Premier League, as well as a humiliating loss at third-tier Milton Keynes Dons in the League Cup. Managers often complain about the first international break, resenting the intrusion that interrupts their schedule and momentum before it has barely had chance to pick up speed. But van Gaal could be forgiven for relishing the opportunity to refine his plans for United over the next two weeks following their latest lacklustre effort against a Burnley team, who cost just £5million (€6.3million) to assemble, at Turf Moor on Saturday. The former Netherlands boss had already warned it will take several months at least to fix the fallen giants following the ill-fated reign of David Moyes and he offered a distinctly unimpressed review of United’s current status after they failed to break down newly-promoted Burnley. Van Gaal, whose team will be stuck on two points — their worst start since 2007 — until they face promoted Queens Park Rangers on September 14, admitted: “We don’t look world-class at the moment. However, having scanned the fixture list to reveal games against Leicester City and West Ham United before the end of September, the Dutchman will expect his team to have hoisted themselves towards the right end of the table sooner rather than later. By then he should have been joined by compatriot Daley Blind, the 24-year-old Ajax star who was a key part of van Gaal’s Netherlands team at the World Cup and is expected to sign imminently for around £14million (€18million). Blind’s arrival will continue van Gaal’s £150million (€190million) overhaul of the United squad following the debut of Angel Di Maria on Saturday. The Argentina midfielder, who cost a British record £59.7million (€75million) from Real Madrid, lasted 69 minutes before making way for Anderson after taking a kick to his calf. Di Maria showed one or two nice touches at Turf Moor, but van Gaal said: “He was not the world-class player we have seen in Madrid. At least there was no further defeat for van Gaal to face. United were spared that when David Jones, the Burnley midfielder who began his career at Old Trafford and captained the team that won the FA Youth Cup in 2003, sent his third-minute free-kick against David De Gea’s crossbar with the goalkeeper beaten. Tom Heaton, Burnley’s other United old boy in the home goal, found Robin van Persie and a subdued Rooney a less intimidating strike force than he might have expected, though he did well to parry at close range when van Persie collected Di Maria’s perfect pass. Email “Louis van Gaal: 'We don't look world-class at the moment'”. 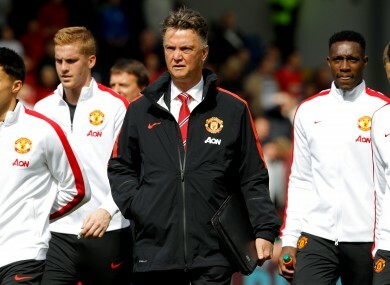 Feedback on “Louis van Gaal: 'We don't look world-class at the moment'”.